Leeks are so tasty and so healthy that, in France, cooks almost always add one or more leeks to vegetable soup. As a filling for the tart, they have an intense flavor and are a nice way to get all your helpings of greens in one treat. Pick the leeks well, if they have a hard woody stick in the core, they have not been harvested on time, and they will not be tender. Best are the leeks with lots of white and yellow and light green with tender leaves in the centre. They need a vigilant rinse under cold water as they are notorious for trapping sand and soil, this is easily done if you split them in halves vertically. Then, chop them in pieces about one inch long. In your largest frying pan sauté four leeks in olive oil with one chopped onion until the onion is barely translucent, just 2 minutes or so, otherwise the leeks will become bitter . Then add 2 cups water, salt, a cube broth. When all the liquids are completely gone, if the leeks are cooked, transfer them in a sauce blanche. To make the sauce blanche, add a tsp flour to two tsp butter, mix with a whisk, adding 2 cups cold whole milk, or a combination of milk and cream depending on how creamy you like the leeks. When it is smooth and thick, add one egg beaten and 1/2 cup grated Swiss cheese. 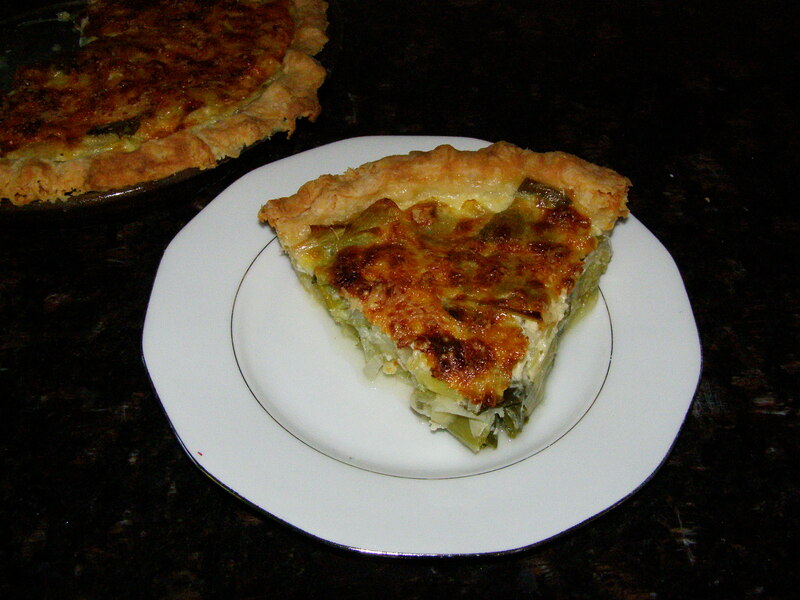 Last, fill a pie shell with the sauce blanche/leek mix and sprinkle with 1/4 cup grated cheese. Bake 45 minutes on 325. Tip: if you have any, replace up to 1/2 cup of water with white wine. Hint: serve this at lunch, leeks are extremely diuretic (meaning extremely healthy but likely to make you pee more). Last word: If you added a pastry cover on top of the leeks, you would call it a flamiche, a signature dish from the North of France. My husband always makes the pastry for pies, quiche etc…His secret. My sister’s recipe works well, just had it when I was staying with her in France, see below. 1 3/4 cup all-purpose flour, 1/2 cup butter, 1 egg yolk, 2 tbsp cold water, salt. Add the butter to the flour and salt in bowl by cutting it in with 2 knives, add the egg yolk, the water, mix. Transfer to a board and roll to fit the pie dish. Make small holes in the bottom with a fork. Pre-bake 10 min in very hot oven before filling. Add filling, bake 20 minutes. 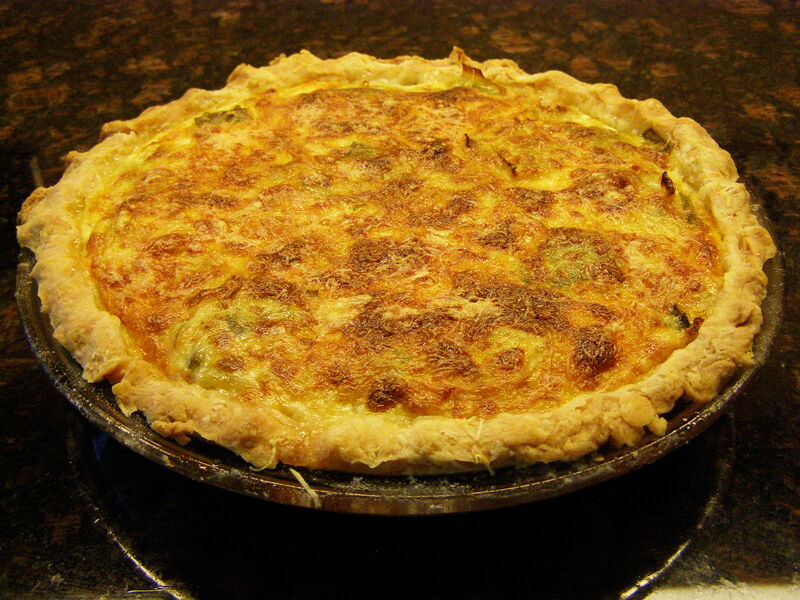 This entry was posted in Lunch, Starter and tagged food, leeks, lunch, poireaux, quiche, recipe, recipes, tarte aux poireaux. Bookmark the permalink. Who made the lovely looking pastry? Was it you or DB? Also, why should you eat it at lunch if leeks are extremely diuretic?